(TibetanReview.net, Apr11’19) – A new campaign is underway at Sera Monastery in Tibet’s capital Lhasa, ordering its monks to strictly obey Chinese laws and take a “stand against separatism” in keeping with the country’s ongoing Sinicization-of-religion policy, reported the Tibetan Service of rfa.org, citing official Chinese media reports. The report cited Lhakpa Tsering, government-appointed director of the Monastery Management Committee, as having told a news conference Mar 13 that “standing against separatism” should be the basis of the monks’ practice of their faith. “Monks must feel grateful to the Chinese government and show their loyalty to the nation by obeying the country’s laws,” Tsering was quoted as saying, addressing an audience of 320 that included monks, management staff, police officers, and security team members. Tsetan Dorje, a government-appointed management official at Sera, has cited a set of “20 Prohibitions” introduced in February to remind the audience to abide by these restrictions in their postings on popular media platforms such as WeChat and Weibo. He wanted them to take care not to spread information or other materials that the government considered to be politically sensitive. And Jampa Kelsang, the director of the monastery’s government-appointed Media and Education Committee, has called on the gathering to always “repay China’s generosity” in Tibet with loyalty and love for the top leadership of the Chinese Communist Party. 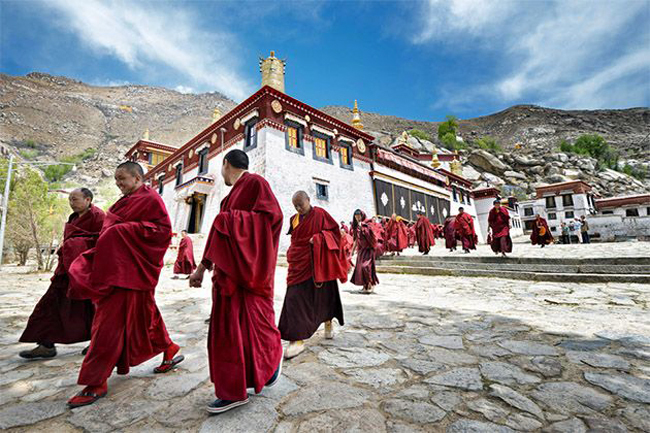 It was earlier reported by China’s official globaltimes.cn Mar 26 that more than 30,000 Buddhist monks and nuns in Tibet Autonomous Region had been tested on Mar 25 for their knowledge on laws and regulations, with ostensible aim to improve their legal awareness and consciousness. Shorn of the propaganda euphemism, however, the Buddhist community was examined for its loyalty and patriotism towards the Communist Party of China and the Chinese state run by it.